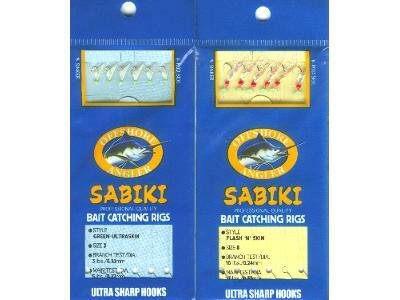 Sabiki Bait Catching Rigs by Offshore Angler smaller hooks light line for smaller baits. When you come across a school of bait in the water on your hunt for the big ones you may want to get a few of the smaller baitfish in case you run across a good kelp paddy or debris in the water holding dorado tuna or yellowtail to name a few. Sometimes the local fish want the bait from the area and are difficult to get to bite the artificials. These smaller bait catching rigs can help get the bait from the ocean to the bait tanks in no time at all. Six hooks in 2 sizes and styles to choose from for the small mackerel to the anchovy these are you ticket to success. Lite line is sometimes a must have to get bait and the small hooks help to keep the bait from being damaged too severly to keep alive in the baitwells and bait tanks. These help get the job done quick and then it's off to fishing again. Size #8 has green glow in the dark beads and flash "n" skin. Size #6 has red head veilskin . All have ultra sharp hooks. Jan 13, 2003 David B The smaller ones work great for smelt on the great lakes. I used them through the ice.